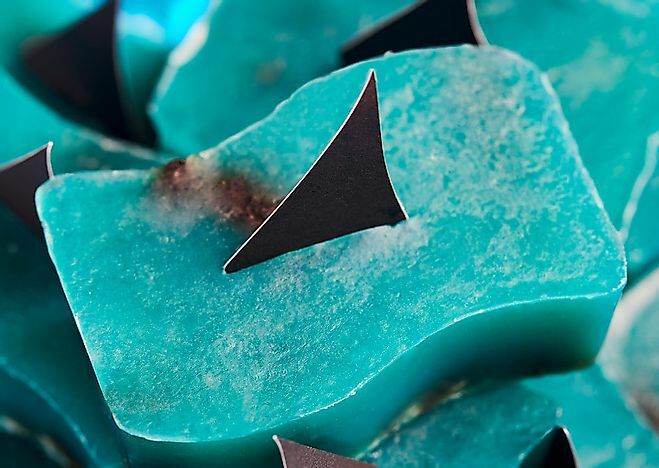 Lush has rereleased their Shark Fin Soap in conjunction with the Rob Stewart Foundation in an effort to curb shark finning and protect ocean life. Shark Fin Soap. Photo credit: Lush Cometics. Although sharks have gotten a bad rap over the years, they are an important part of the ecosystem. Swimming through the world’s oceans for the past 420 million years, the over 500 species of sharks play a crucial role to the delicate balance of the ocean and the planet. However, due to overfishing sharks are now highly threatened with almost 100 species at risk of extinction, listed as either critically endangered, endangered, or vulnerable and with another near 100 species listed as near threatened. The most threatened species have seen devastating population declines of about 90% in just the past 30 years. To combat this disastrous trend, many people, organizations, and businesses around the world have worked to educate the world about the importance of sharks and shark conservation. World Atlas recently had the chance to speak with Carleen Pickard, Ethical Campaigns Specialist at Lush Fresh Homemade Cosmetics about their ongoing role in shark conservation. Through their Charity Pot Program, Lush became active in the Fin Free Movement spearheaded by the late environmentalist and filmmaker Rob Stewart. “Lush‘s Charity Pot team was first introduced to Rob through our combined work on supporting ocean and marine life protection. 2014 saw the first campaign with Fin Free, which brought the plight of sharks being killed en masse for their fins into the spotlight and was spearheaded by Rob via the United Conservationists. Together we joined with the Discovery Channel to amplify the message in alignment with Shark Week, when the world’s eyes were turned on our most misunderstood marine friends. A 30-second commercial promoting shark conservation produced in partnership with Discovery and Fin Free aired during Shark Week, the network’s highest rated week of the year. This is also the year that Shark Fin soap was born! 100% of the sales price in that year went directly to Fin Free, boosting their efforts to protect sharks as the world began to wake up to the cruelty of shark finning. After his passing in 2017, Rob’s family established a foundation in his honor to continue his efforts in the conservation of sharks and to bring an end of shark finning. Lush revived Shark Fin Soap on World Oceans Day in 2017 to raise funds for the newly established Rob Stewart Foundation. July 22, 2018 marks the 4th release of Shark Fin Soap. The company is aiming to sell 3,350 soaps during the campaign, amounting to $20,000 USD. With 100% of the proceeds going towards the foundation, it will be joining the $550,000 USD Lush has raised through the previous three campaigns for shark protection and ocean conservation. Overfishing is one of the largest threats to sharks, with conservative estimates showing that 70-100 million sharks are killed every year due to commercial fishing. Sharks are fished for their skin, organs, teeth, meat, and fins. The most common usage of commercial shark fishing is as seafood, with shark meat and shark fins eaten in many places around the world. In Asia, shark fins are considered a delicacy, especially in shark fin soup. Shark fins make up a large part of the commercial shark fishing market. Although when fished commercially, the hope is that the finned shark is retained for its meat and various other purposes, in many cases sharks are finned and dumped back into the ocean alive. Not only is this a waste of 95% of the shark but leads to the now immobile shark quickly succumbing to predators or suffocation. Photo credit: Brian, Sandy and Alex Stewart. Rob Stewart was confronted with his head on when he arrived in the Galapagos Islands in 1999 to photograph sharks and instead found hundreds dead and dying sharks being fished for their fins. The sharks were being illegally hunted with the marine reserve. Stewart, wanting to share this with the world, created the critically acclaimed film Sharkwater. Since its premier at the Toronto Film Festival in 2007, it has been viewed by over 124 million people around the world and has resulted in over 120 countries banning shark finning. His next film, Revolution, focused on exploring how ocean conservation would lead to the survival of our own species. Sharkwater: Extinction, to be released Fall 2018, examines the industries that continue to hunt sharks to extinction. You can find Lush’s Shark Fin Soap here in Canada, and here in the US. You can also learn more about the Lush Charity Pot Program here, the Fin Free Movement here, and the Rob Stewart Foundation here. Kelly Bergevin is a writer and editor based in Montreal, Canada. She is an avid learner and has recently turned her focus towards environmental issues and wildlife conservation efforts.